This command sets the switch to become backup root for a given VLAN. It works by lowering the priority of the switch until it becomes one priority higher then the root, so it will take over if the root fails. Once the switch is root it will not prevent any other switch from becoming root. 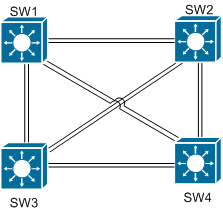 Now we will configure SW2 to become the backup root for VLAN 10. We can see that SW2 is now has a priority of 28672.